Another gem of a garden found via a traffic shortcut. * I’ve been admiring it for some time and stopped by last night for photos. 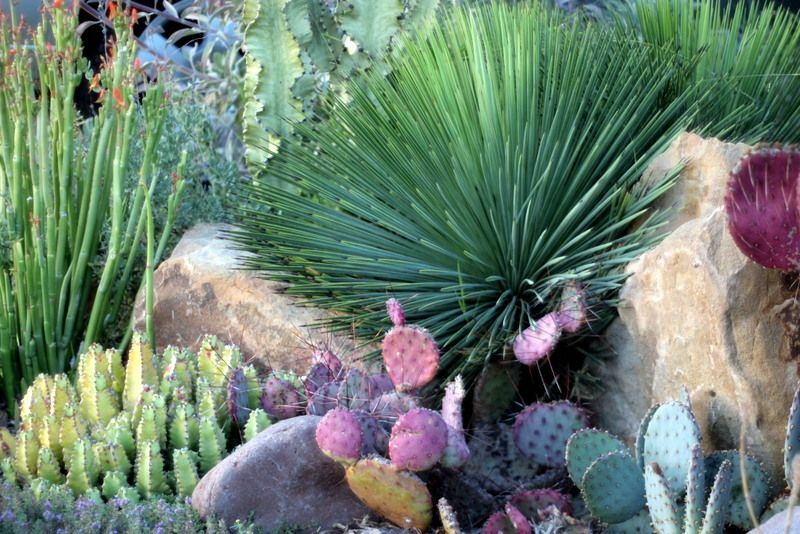 Driving by, the tall succulents, a Furcraea macdougalii about the size of mine, Euphorbia ammak and ocotillo, were the first striking outlines to capture my attention traveling at the speed of a car, all three plants being good enough reasons to later investigate on foot. 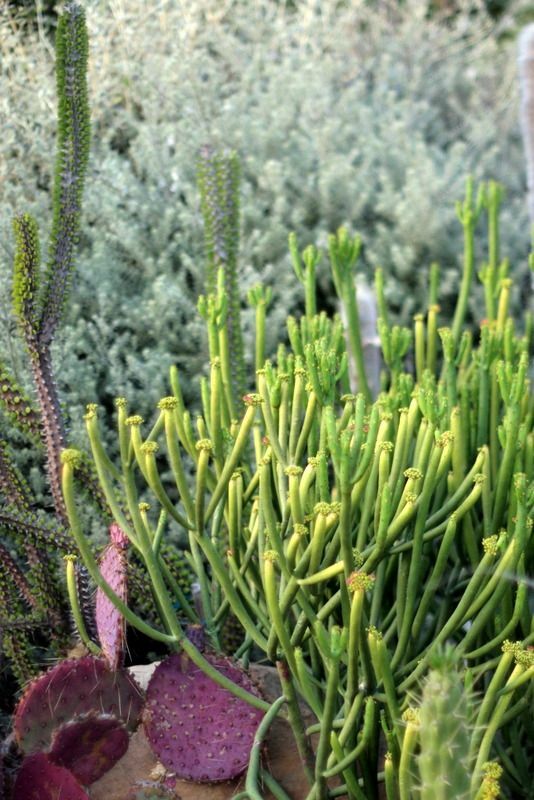 Maybe I’m biased, but from a purely aesthetic point of view, to me some of the most successful lawn-free front gardens I’ve seen locally have featured succulents. Their strong outlines are perfectly suited to conform to that tyrannical template we all inherit with these small houses — the path slicing through the middle of a geometric grid enroute to the front door. 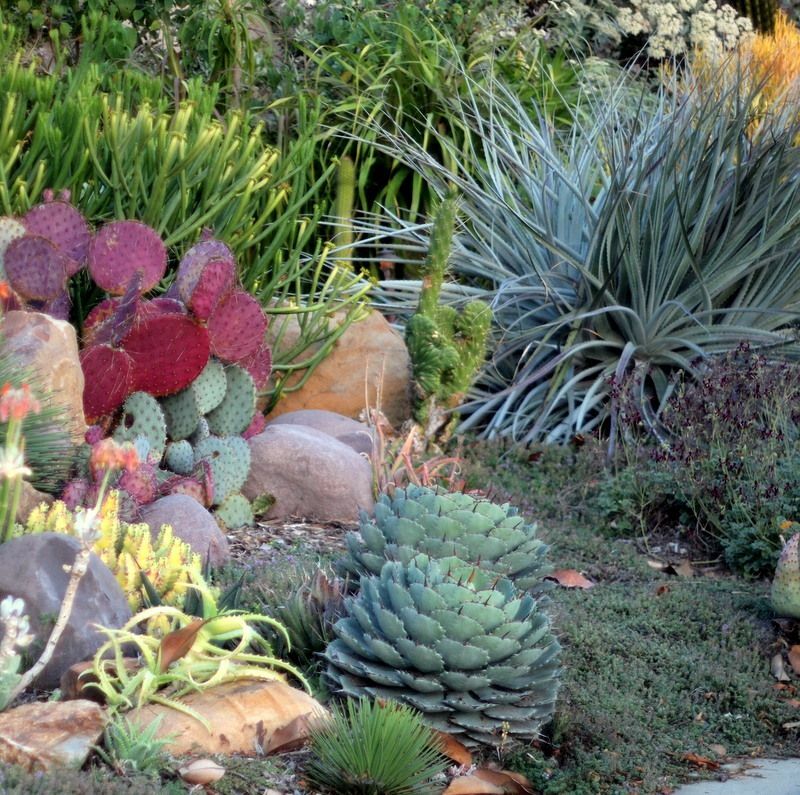 Succulents have an inherent formalism of structure that suit the rigidity of these ubiquitous layouts that were designed to be horizontally dominated by smooth turf, but their diversity, supercharged dynamism, strong colors and shapes subvert the traditional notion of a staid front garden. All while still managing to be neat and tidy 365 days a year (here in zone 10) and incredibly easy on the monthly water bill. 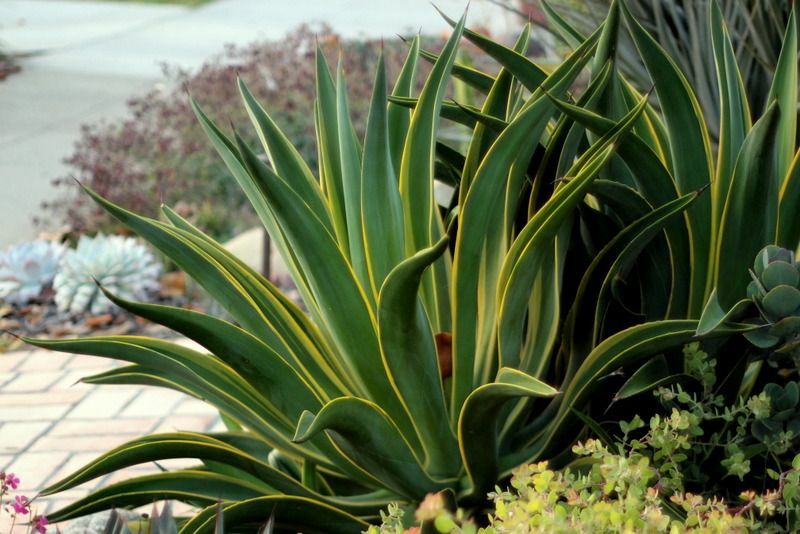 A love of beautiful plants and a strong eye for design can produce startling effects even within this typical suburban design framework. 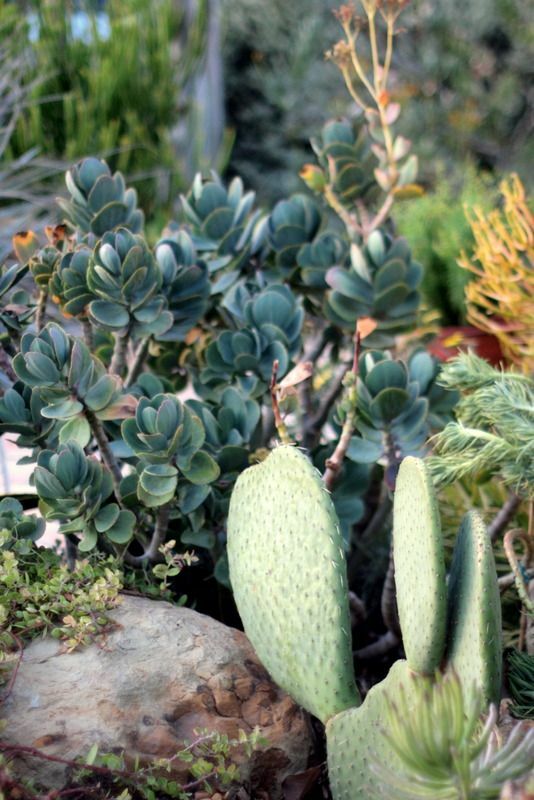 I’ve tagged most of the agaves but leave the ID of the opuntia and other cacti up for discussion. 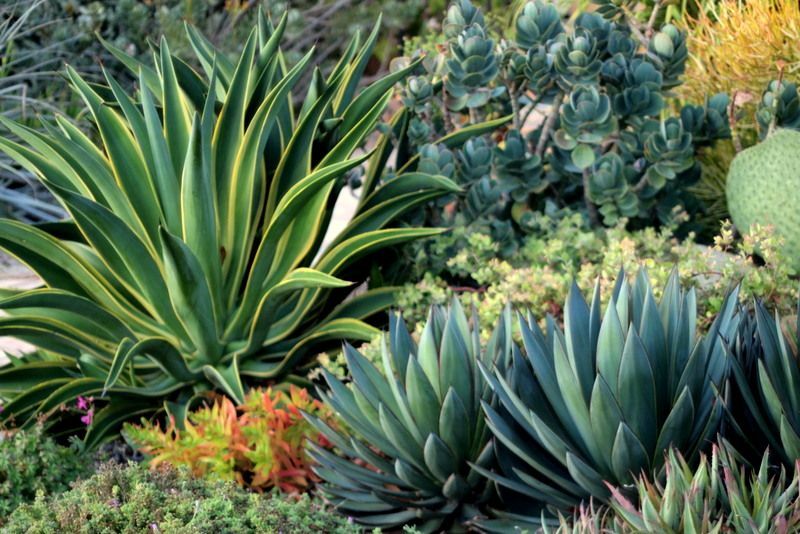 Agaves included are ‘Blue Glow,’ desmettiana ‘Variegata,’ macroacantha, parryi, stricta, bracteosa. 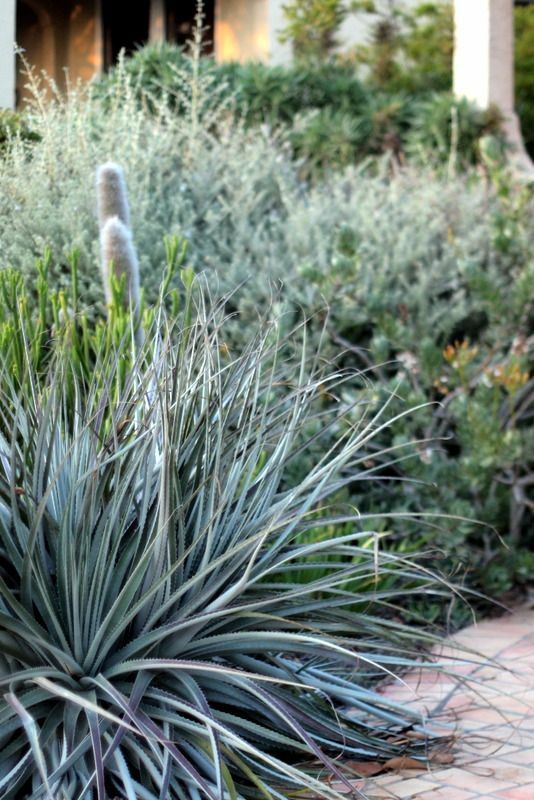 My own Agave desmettiana ‘Variegata’ bloomed this year, its space already taken by smaller, if less dramatic agaves. I’m blanking on this writhing, silvery mass with serrated leaves. Dasylirion? Puya? Nolina? 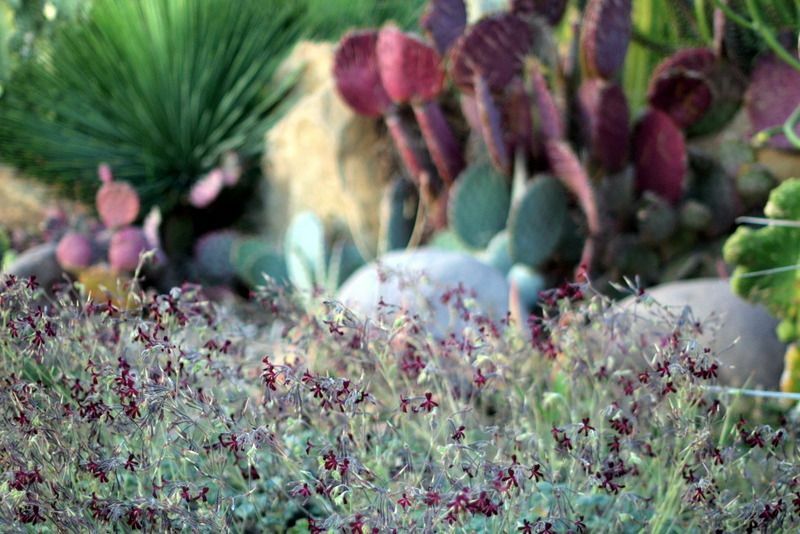 Silvery shrub in the background is a westringia. 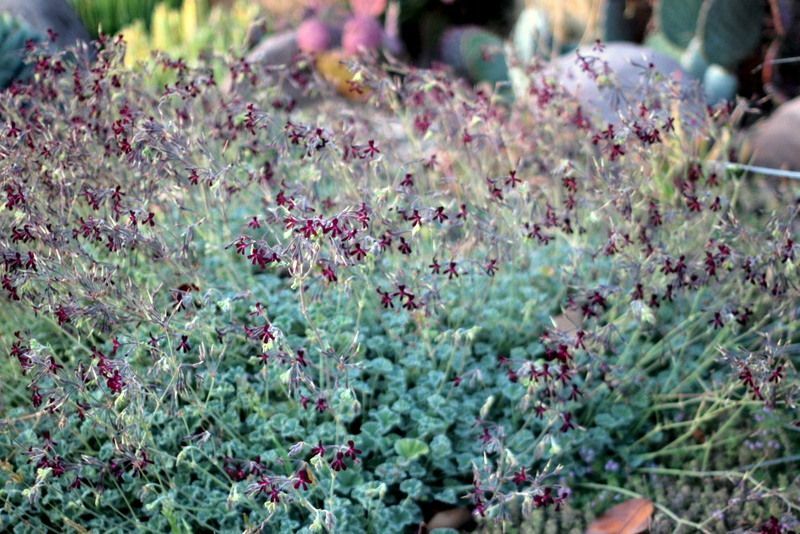 Along with the Pelargonium sidoides, pollinators can find something of interest in flowering ground covers and a big native buckwheat near the front window, St. Catherine’s Lace (Eriogonum giganteum). The pencil stems with orange flowers on the far left looks like a pedilanthus. 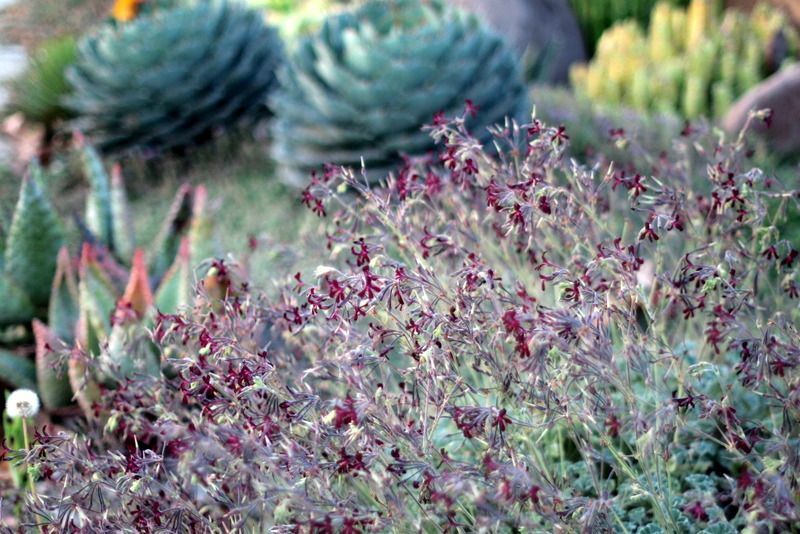 Small-scale ground covers eloquently underplant the rosettes including this Agave potatorum. 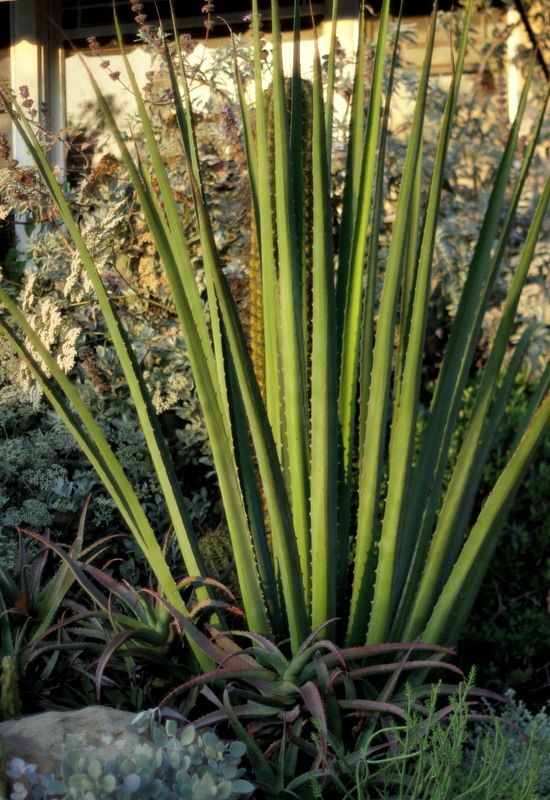 Aptly named squid agave, A. bracteosa. The strewn leaves are from a neighbor’s parkway magnolia. 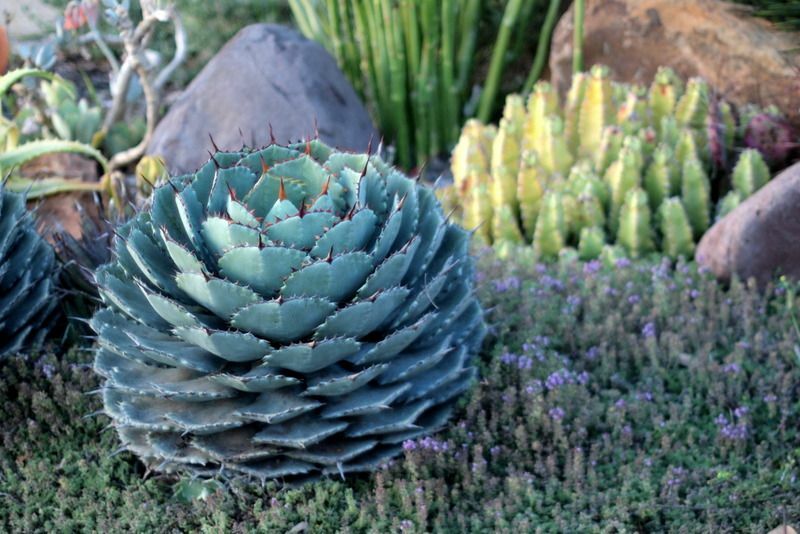 Agaves nestled snugly into the well-placed rocks. 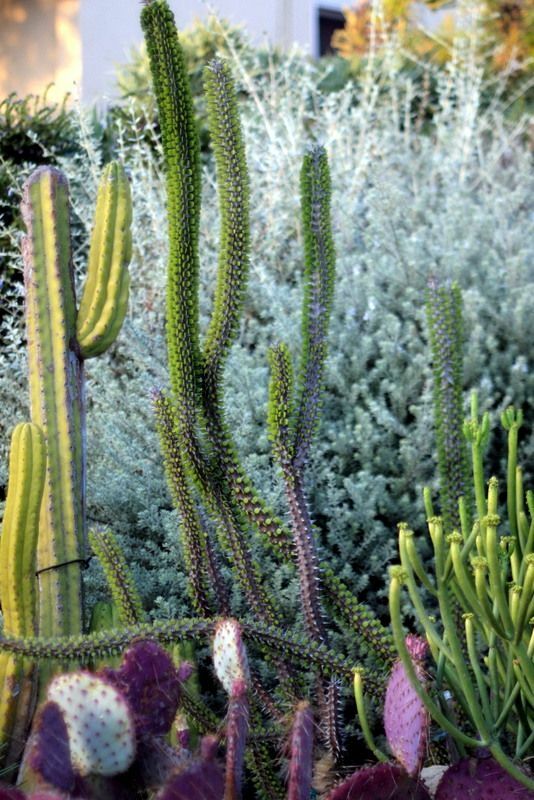 Ocotillo and a pencil euphorbia, possibly E. leucodendron. 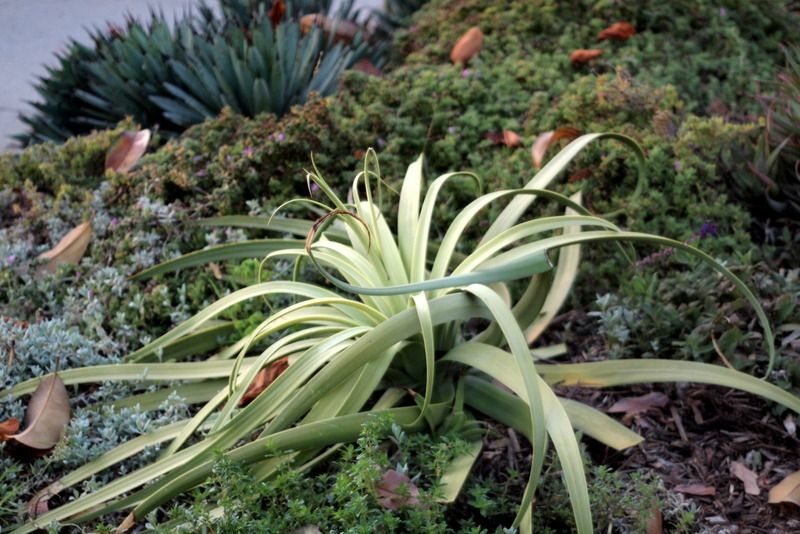 I mostly avoided taking photos of the house, but the Furcraea macdougalii was smack in the middle of a front window, backed by eriogonum. 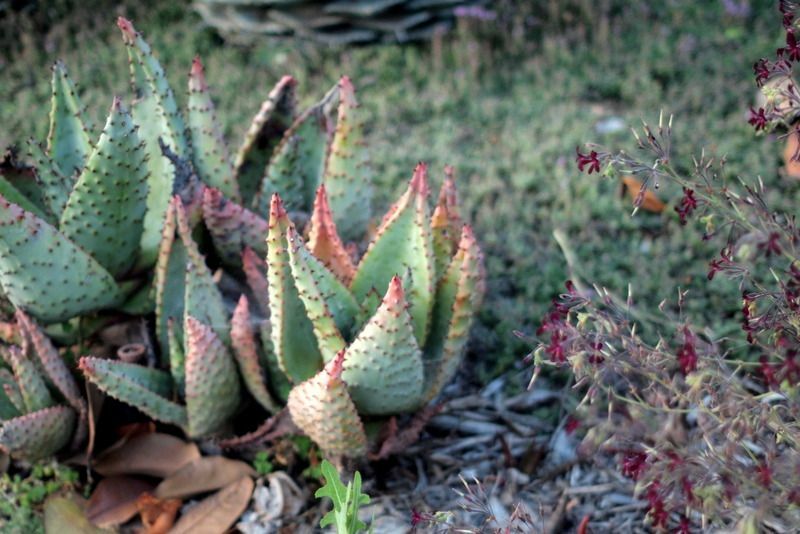 Wreathed in aloes at its base. 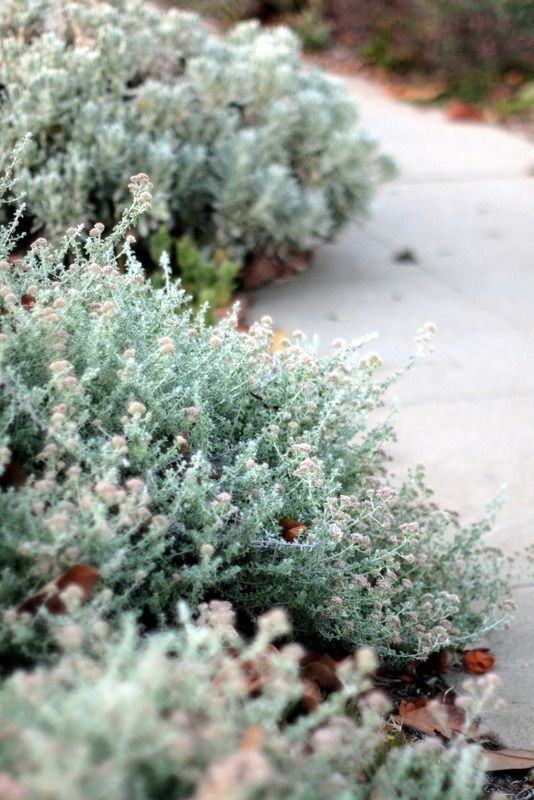 The parkway/hell strip was all helichrysum silver. Except for this one, which I’m pretty sure is a sideritis, the first I’ve seen locally outside my own garden. 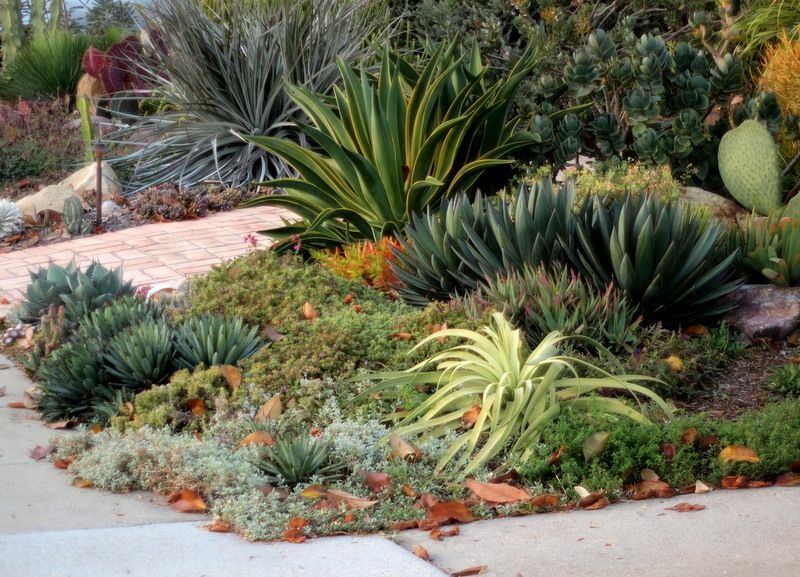 Front gardens like this always beg the tantalizing question: What on earth did they save for the back? *Once again a traffic jam forced me into taking a lesser-traveled route. So I’ve been admiring this newly found garden since spring, during the recent Stanley Cup playoffs and final series, driving en route to watch the games with my mom. After my dad died, we all took up the one sport he never followed, initially as a means to get together frequently during the week. I’d never been a fan of any sport before but knew that televised sports had been an important part of their marriage. I caught an Olympic hockey game in 2010 and admired the speed and athleticism, and thus we started following the fortunes of our beleaguered, star-crossed local team. At first we were unable to even keep an eye trained on the whizzing puck and found the unspoken rules mystifying. But then the Los Angeles Kings did the unimaginable, winning their first Stanley Cup not long after we became fans, keeping their diehard fans waiting over 40 years. In 2012 we still barely understood the concept of icing the puck. This last season, stretching from October to June, was an endurance test for the fans, too, but astonishingly ended in another Stanley Cup. Unlike me, my mom can recite the jersey number and stats on every team member, and she now finds golf and baseball unbearably slow to watch. Go Mom! Go Kings! 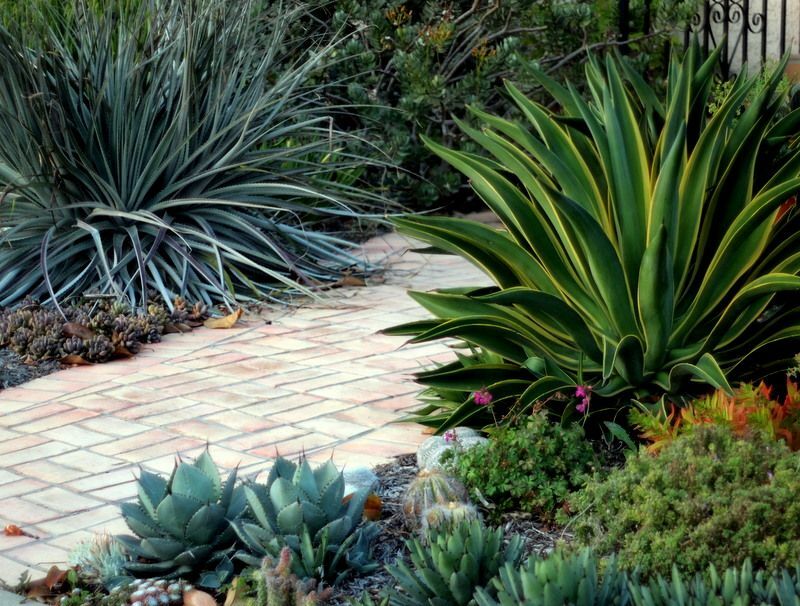 This entry was posted in agaves, woody lilies, driveby gardens, succulents and tagged Agave 'Blue Glow', Agave bracteosa, Agave desmettiana 'Variegata', Agave macroacantha, Agave potatorum, Agave stricta, Aloe plicatilis, Crassula 'Campfire', Eriogonum giganteum, Euphorbia ammak variegata, Euphorbia leucodendron, Fouquieria splendens, Furcraea macdougalii, kalanchoes, Ocotillo, opuntia, Pelargonium sidoides, St. Catherine's Lace, Sticks on Fired/Euphorbia tirucalli. Bookmark the permalink. 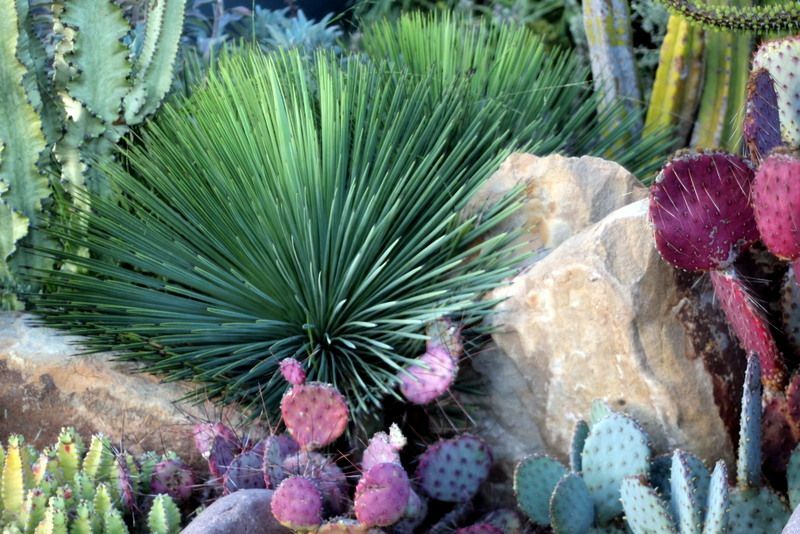 Another ASTOUNDING garden! Why don’t I ever find anything that great when I get rerouted by traffic? You’re simply going to have to knock on the door and ask. And please document it if they let you see it. 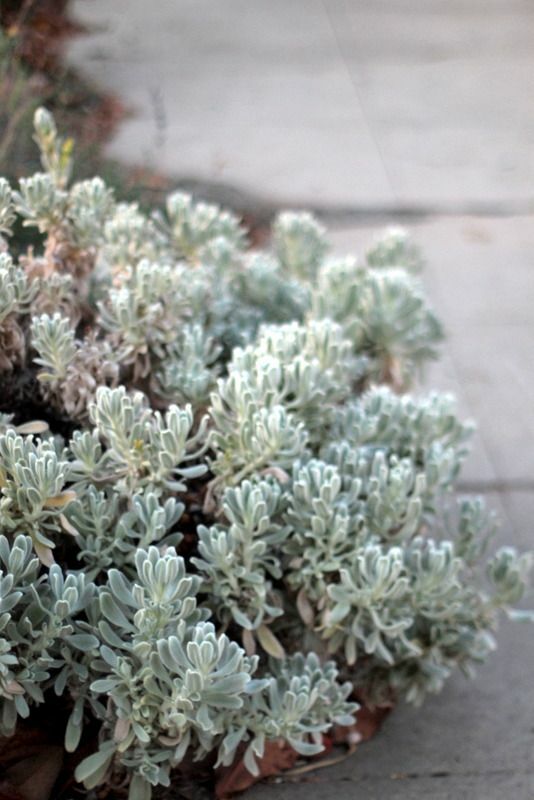 How can so many different succulents look so beautifully cohesive and perfect? You need to chat them up for a visit to the back garden, for sure. 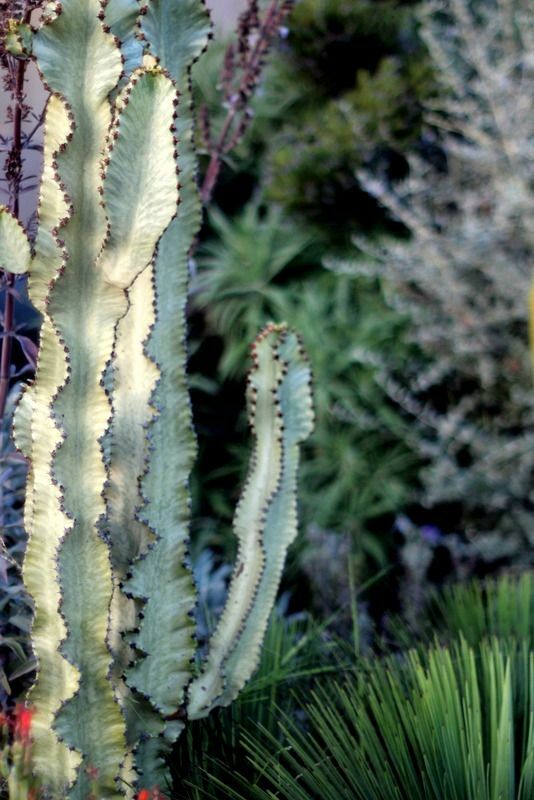 Gorgeous photos of a gorgeous garden! 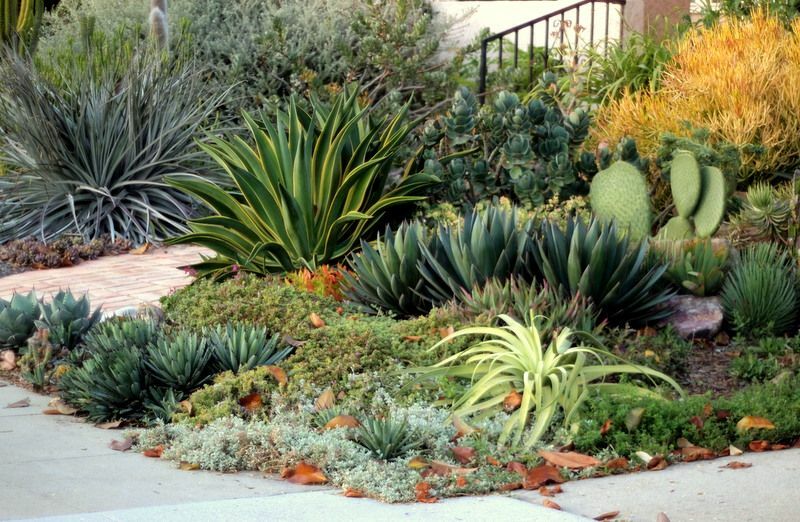 It’s what I hope my front garden will be when it grows up – the grass is gone but it’s going to take some time to attain anything approaching this. Thanks so much for sharing something to aspire to! This is my kind of garden. So much to look at, admire and be inspired by. Fantastic! No weeds in that garden (thankfully, as removal could endanger life and limb). 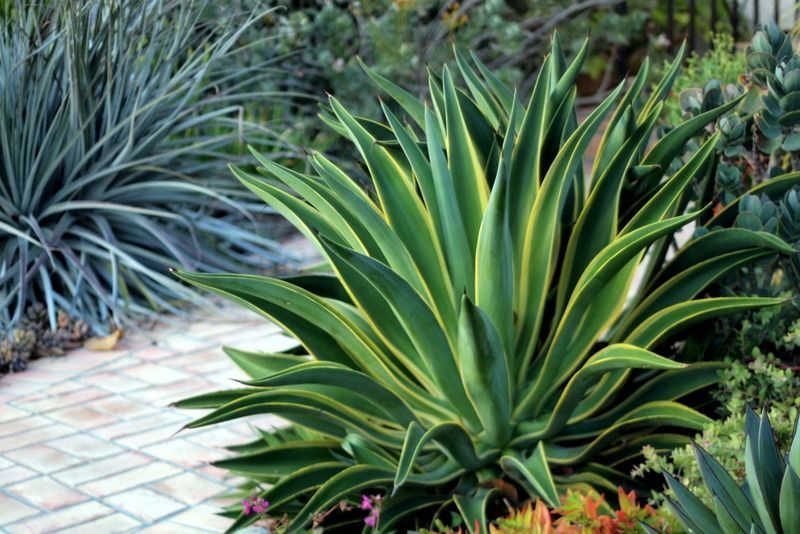 Now I really wish I hadn’t recently passed up on Agave desmettiana ‘Variegata’! I’d need a posse of all of you for the courage to knock on the door and ask to see the back garden! Really great garden. You found a gem. The edges are particularly well done. I’m having trouble with the edge on my front slope. So dry, hard to figure out what will work. Denise, this post was fantastic! If I discovered this garden I would be stalking the house to get repeated views! 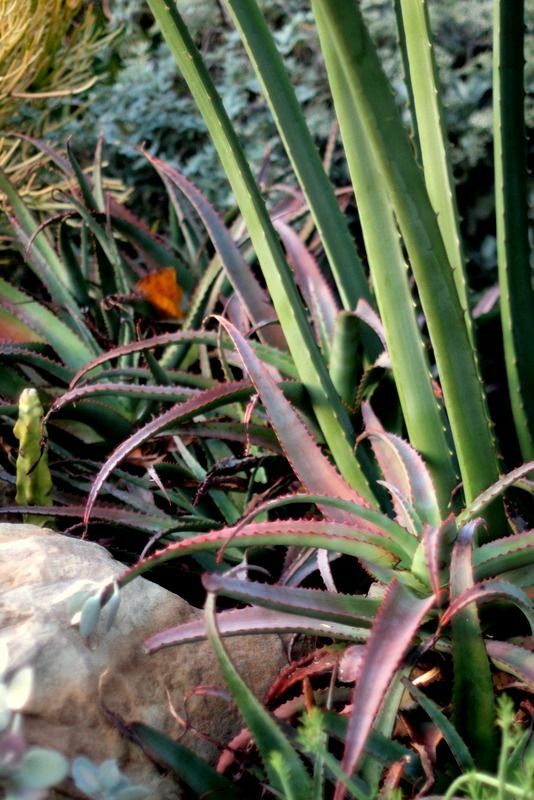 Thanks so much for so many of the plant names. I loved your story about the Kings, my family are Kings fans and watching the playoff together was great family time!